Deep South Magazine and their #literaryfriday goodness: Carl Hiassen’s Most Memorable Characters, Wiley Cash news, and more. Plus, the Author Spotlight that was featured yesterday on Erika Marks on my blog, Traveling With T, made the #literaryfriday news! Literary New England is getting “chatty” during the month of July- 2 author chats lined up: Nichole Bernier, The Unfinished Work of Elizabeth D, chats with @litnewengland July 2nd from 8-9PM EST. There will be a #giveaway! Then July 10, Erika Marks chats from 8-9pmEST- there will be a #giveaway for her chat as well. Use #LNEchat to participate. Anita Loves Books is giving away a copy of Looking for Me by Beth Hoffman. #giveaway ends June 16th. She Reads as part of their Books of Summer series features Meg Donohue. Read her Tell Me Something True: A Visit with Meg Donohue to find out some about All The Summer Girls. 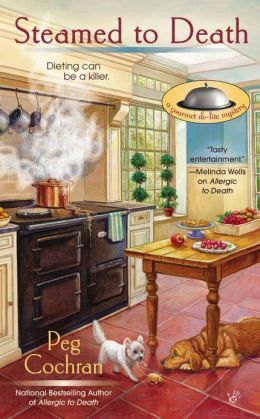 Today, I reviewed Steamed to Death by Peg Cochran for Cozy Mystery Reviews! The #giveaway is still going on for Erika Marks The Guest House. Comment on Erika Marks: Author Spotlight for a chance to win! What are you reading for #fridayreads? I’m reading The Engagements by J. Courtney Sullivan, The Wishing Tree by Marybeth Whalen, Reconstructing Amelia by Kimberly McCreight and hoping to get in Time Flies by Claire Cook. Speaking of The Engagements by J. Courtney Sullivan- it is mentioned in OBSESSED- The 20 Next Big Things in Glamour’s July 2013 magazine. Gigi Fitzgerald has signed soap-star, Felicity Davenport, as one of her clients for Gigi’s Gourmet De-Lite. Gigi is pretty excited as she hopes that this will help put her business on the road to success. Gigi is also excited because her and her best friend, Sienna, will be working together some to help Felicity re-brand her image (Gigi with weight loss and healthier living, and Sienna with public relations). All seems to be going well until Gigi sees an article in the paper questioning if Felicity has a new boy-toy and the boy-toy in question is Sienna’s husband. Later, when Felicity’s body is found- the police question Sienna about her work relationship with Felicity. Gigi, being no fool, knows that Sienna could not have killed Felicity- and also knows that the police are considering her a suspect. So Gigi, Sienna and Alice team up to find who could have killed Felicity. The list is long- and each person has a motive. Could it be Felicity’s husband? Or her manager? Or the actress, Vanessa, that wanted more air-time on the soap opera where her and Felicity were actresses? Gigi’s hands are pretty busy with trying to figure out who had the most to gain by Felicity’s death- but to add more to her plate- she has 2 men in her life. One is an incurable flirt, Declan, owner of a restaurant in town. The other is Detective Mertz, who Gigi would like to get to know better; but work seems to get in the way. Does Gigi solve the mystery? We, as readers, need to hope so- or it’ll be the end of delicious recipes from Gourmet De-Lite! This is my first Gourmet De-Lite mystery. Enjoyable. Characters that are interesting. Romance. Good plot. Funny at times. I would definitely consider reading more of Gigi! This is a fun, extremely versatile dessert that you can whip up on the fly for unexpected guests. It takes plain ice cream to a new level. It can be adapted in a myriad of ways—if you are serving children instead of adults, use Oreo cookies mixed with sprinkles or chocolate chips or whatever comes to mind. If you don’t care for Amaretto, you can substitute another liqueur or leave it out. Same with the nuts—try chopped pecans, pistachios or peanuts. Put vanilla wafers in a plastic zip-lock baggie. Crush with a rolling pin or meat mallet. Spread out on a cookie sheet and mix in sliced almonds. Sprinkle with Amaretto if using. Roll individual scoops of ice cream in mixture. Place coated ice cream scoops on a cookie sheet. Put in freezer for at least an hour to harden. Peg Cochran writes Gourmet De-Lite Mysteries featuring Gigi Fitzgerald. 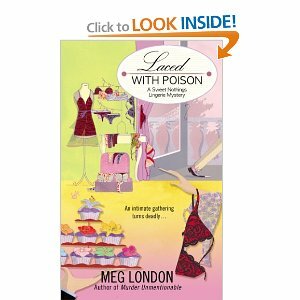 She also writes as Meg London. 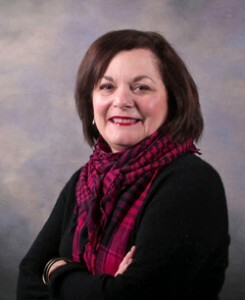 To find out more about Peg, please visit her website. *Note: This is the 2nd book in the Silver Sleuths series. While Deadly Policy does make some references to the previous book (Classic Revenge) in the series, it’s not necessary to read in order. Millie, Trish, and Edna- to the outside world- a 80 year old, a 45 year old, and a 65 year old might not appear to have much in common- but these ladies have a friendship that is strong and will last to the end of time. Neighbors and friends, Millie, Trish and Edna share a spirit about life that’s hard to beat! In Deadly Policy, Millie gathers Trish and Edna together to discuss her daughter, Michelle. Millie is worried that Michelle may find herself in some trouble- there has been a sudden increase in stolen cars and all were insured by the company Michelle works for. At first, it appeared to be a coincidence- but with each vehicle stolen- it seems to point to an inside job. Or does it? Millie decides that she, Trish and Edna will get to the bottom of this mystery before anyone can accuse Michelle of being part of an inside job. Millie, Trish and Edna set about to find if there is a pattern to the stolen cars, clues, and other things to help solve the mystery. Millie is convinced that Michelle’s ex-husband, Tony, is the bad guy- but both Trish and Edna caution her to keep an open mind until they have more facts. Michelle and Richard (her boss) are trying to stay positive, but with Richard’s ex, Barbara, floating around and disgruntled customers wanting their insurance money, it’s hard. Then, when a dead body is found outside of the insurance office, the ladies are really worried for Michelle and know they must get to the bottom of this mystery quickly. When clues begin to surface because of the hard work of Millie, Trish and Edna- the women hope that the mystery is close to being solved and that Michelle will not be part of an internal investigation. However, this particular villian has other plans in mind. Will the Silver Sleuths solve the mystery? Read Deadly Policy to find out. 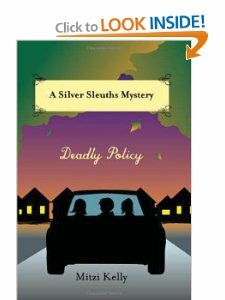 *Blogger note: This is my first Silver Sleuth Series book to read, and while I enjoyed the characters, the setting and the mystery- I did find one character a bit annoying at times. However, the actions of the other 2 work well as a balance. Each character has something that is relatable, a sense of spirit that is enjoyable.These women, especially Millie, show that life does not end at 40. Recommended for: cozy fans, readers looking for characters over 40, readers wanting stories of friendship. GIVEAWAY: Mitzi Kelly has generously offered each tour stop on the DEADLY POLICY blog tour sponsored by Cozy Mystery Book Reviews a copy of BOTH Classic Revenge and Deadly Policy to give to a lucky person (sorry! US only). For a chance to win the 2 books in the Silver Sleuths Mystery series- comment and tell your favorite cozy mystery series. Be sure and include your email in the comment as well (use the AT and DOT- ex: email name AT service (gmail, yahoo, hotmail) DOT com). The giveaway will be open to April 30th, and the winner will be annouced May 1. Winner will be emailed- so be sure and check your emails May 1! Before I begin my #literaryfriday talk- riddle me this: Why do people want to follow you on Twitter that don’t really care for you in real life? Seriously, looking at my follower list this morning- and I was like “How did you find me?! !” “Why are you following me?” “Why me? !” Ok drama over. 1.Deep South Magazine is taking today off from #literaryfriday- because they are traveling to Arkansas- so no Deep South news. 2. What are your #fridayreads? Mine is American Ghost by Janis Owens. 3. Looking for book tours + giveaways? Cozy Mystery Review has an upcoming one! 4. My review of Malicious Masquerade has been posted to Cozy Mystery Reviews! Looking for a book to read in March? Rebecca- Love at First Book and Allison- The Book Wheel are teaming up- they’ve picked Tana French’s In The Woods as their March book club pick and would love for you to join along. Read HERE for more info on how to join along! March #gr8Books Book Club Selection is Wife 22. 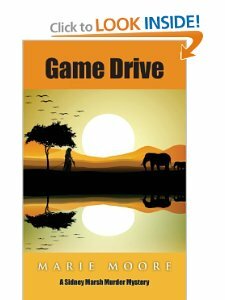 Join in the discussion of the book on Twitter March 5,2013 from 8-9pm CST. Read HERE for more info! And don’t forget: I’m hosting a Twitter chat with Julie Kibler about her debut novel, Calling Me Home, on Feb 20 from 2-3pm EST. Use #srchat to join in. Can’t come? Don’t worry. The online book club discussion will begin on Feb 25 and will go on all week long. Go to She Reads to join in! It’s Tuesday- and I’ve got a few things to say, but nothing that fits under one cute title- hence the random thoughts! Cozy Mystery Book Reviews is still doing the 31 days of giveaways for January. If you are a cozy reader- check it out! MVB Club is celebrating their 1 year Anniversary as bloggers! Join me in extending them congratulations to a great first year- and to many more! I’m reading A Good Hard Look by Ann Napolitano. Really enjoying it. However, I’m also reading The End Of Your Life Book Club– and honestly, I’m not enjoying it that much. Perhaps, my expectations were too high as everyone I know was raving about book. Thoughts?